Jesus Christ died. He died quivering on a cross, after receiving a horrific public thrashing that would have killed any other human. He died after carrying His own instrument of death, the top part of the cross, to Golgotha where He was brutally and efficiently nailed to the beam He carried. He died after hanging between heaven and earth for about six hours in unexplainable agony. To make certain of His death, the order was given to pierce His side with a spear which released the very last drops of His blood. The professional soldiers who carried out the crucifixion detail were seasoned veterans with many crucifixions on their resumes; these hardened men were so certain of Jesus Christ’s death they did not even take the time to break His legs, as it was quite plain to see He was dead, He was finished. Pilate, the Temple High Priest, and all of the religious leadership in Jerusalem were also certain of this fact, and rested in the knowledge that they had successfully killed an uprising, as well as this so-called King of the Jews, this Son of God. It is done! It is finished! As the afternoon sun faded and the late day shadows began to grow so did the shadows of hopelessness and utter dismay and gloom by Christ’s disciples. Such brooding sadness appeared that only dazed looks with puzzled grief that knew no words were exchanged among those who had been the closest followers, and may I say, “Believers.” Utterly crushed, beaten, and most likely Wanted Men…these men had just hours prior sat at table with the man they came to know as The Son of God; the long awaited Messiah! These men now scattered in an attempt to pick up any remaining pieces of their lives interrupted a little over three years before. Jesus was confirmed dead, but Pilate was reminded that this strange, troublesome religious Dreamer (Nut) claimed He would rise on the third-day. So to make certain that no theatrics could be accomplished a Roman Guard was set at the tomb. The tomb was sealed with the Official Roman Seal to make certain no one would enter (or leave) the burial chamber thereby beginning a new round of zealotry. Even if an attempt was made to tamper with the seal, the soldiers standing post would prevent a successful conclusion, as well as bring instant death to anyone attempting such an act. There would be no more talk about His kingdom being established. There would be no more statements that He could summon twelve legions of angels to His assistance. There would be no more Messiah…He will trouble us no more! Sometime prior to dawn, in a borrowed burial tomb that belonged to Joseph of Arimathea, there was a stirring, a fluttering of unseen forces…the presence of angels, and the unexplainable breath of God moving through the garden and into the tomb. Immeasurable forces poured life back into the dead body that laid on the cold stone slab in that tomb; and the dead man rose and came out of the grave, and out of the grave clothes, and into life just prior to Mary’s arrival as she came to grieve and stand watch. But Mary stood in shock and awe in front of the tomb as the massive stone had been rolled away, and now the sepulchre was empty except for the two angels in white sitting, one at the head, and the other at the feet, where the body of Jesus had lain. As Mary cried-out asking, “What have you done with Him?” she heard her name spoken as only her dear, dear friend, Jesus could speak it, only this time all of heaven was in His tone. And she knew. She simply replied to Him, “Rabboni,” which is to say, “Master.” Mary Magdalene, Joanna, and Mary, the mother of James, and a few other women then ran and got the disciples, but they ran with the news that “Christ has Risen…He has Risen indeed!” The disciples did not expect this to happen no matter how much they wanted it to be true. How about you? Would you have expected this, regardless of Jesus spending a little over three years sharing and revealing His purpose on earth, and the will of His Heavenly Father? How about today? Right now? Do you believe Jesus of Nazareth died for you, was buried for your sins and deeds, and then rose on the third-day? Do you believe? The disciples will understand your doubts, your hesitancy. So does the Lord who was actually in that tomb, but came out! He understands. Eight days passed, and the disciples were together. Suddenly Jesus was with them. These men, who just a very short-time prior were in deep mourning and bewilderment were reported by thousands to be “lights to the world” with their faces and manner, joyous and rejoicing in the good news of Christ’s Resurrection. Ignorant men? Self-serving? An invention by a group of men hoping to cash in? And would you or anyone you know invent such a story so as to be crucified upside down, like Peter? How about stay with such a story causing your head to be chopped off, like Paul, or to be stoned to death like Steven? Each of the disciples, save John, met with a horrible death at the hands of church and government authorities who years later still could not afford to have the Resurrection Story of Jesus Christ shared, much less believed by the masses. Today the forces of darkness, division, confusion, and humanism do NOT want you to learn, much less accept the truth of Christ’s Resurrection from death. Maybe even more today than thousands of years ago, the powers aligned against God’s Word do NOT want you to come into the saving knowledge and grace of the Risen Christ, the Begotten Son of God who surrendered His Crown in Heaven for a Crown of Thorns on earth; His Seat at the right hand of the Heavenly Father for the rugged and splintered wooden cross that became His seat of death on earth. Look again at the picture above my remarks. You are looking from inside an empty tomb across the land to an empty cross. The same cross and tomb Jesus Christ occupied for a short-time before ascending into Heaven for all time, for all eternity. Jesus is not dead! The tomb is empty! 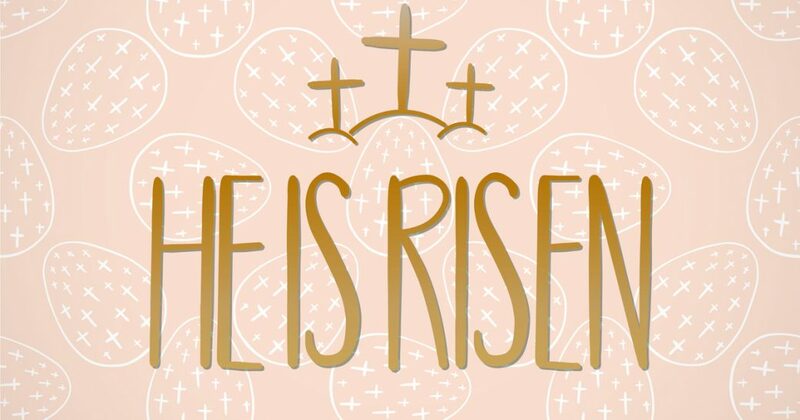 Jesus has risen from the dead…He has Risen indeed!